Being overweight reduces blood flow to the brain, starving it of oxygen and impairing mental function. Those with a high Body Mass Index in their fifties are far more likely to develop the condition in their seventies, a study of more than 1.3 million people found. The research by British scientists shows each five-point increase in BMI raises the risk of dementia by between 16 and 33 per cent. BMI is a ratio of weight to height. So for a 5ft 7in person, five BMI units is equal to 32lb. Experts last night hailed the research as a wake-up call on the “life-threatening” health dangers of being fat. Tam Fry, of the National Obesity Forum, said: “Linking dementia to obesity may not remotely cross the mind of a chubby 30 or 40-year-old but, as this paper demonstrates, it certainly should. Professor Mika Kivimaki, of University College London who led the research, said that in 2015 the number of people with dementia across the world reached almost 45 million, twice as many as in 1990. The study, published in Alzheimer’s & Dementia, suggests that maintaining a healthy weight could prevent, or at least delay, the onset of the condition. The findings also shed light on conflicting results produced by past research which linked low weight to dementia. Professor Kivimaki, of UCL’s Institute of Epidemiology & Health, said this was because patients who had been overweight 20 years earlier often lost weight before their symptoms became apparent. 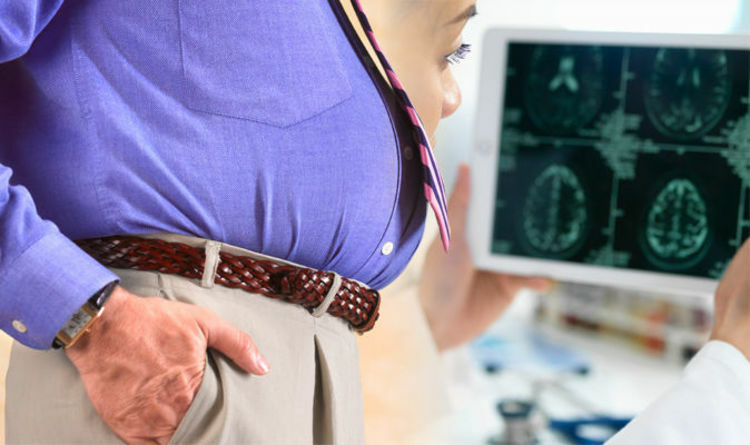 “In this collaborative study of over 1.3 million adults from Europe, the US and Asia, higher BMI was associated with increased dementia risk when weight was measured 20 years or more before dementia diagnosis. “But this association was reversed when BMI was assessed 10 years before dementia diagnosis,” he said.